Use our Australian Bee Gees Plus Buffet deal and pay only $59 for Preferred Seating and a trip to the Excalibur dinner buffet before or after the show. Preferred Seating without buffet is…$60! Truly, this deal is a no-brainer. Click on your friend Coupon Puppet below to pick your date and reserve this great dinner-and-a-show deal. I know what you’re thinking…aren’t all Bee Gees Australian? Actually, no. The original Bee Gees were born on the Isle Of Man to British parents, then moved to Australia in 1958 when Barry was twelve. But that’s neither here nor there. THESE Australian, non-original Bee Gees will make you swear you are hearing the real thing! This tribute band has been playing Bee Gees music for twenty years and they have got it DOWN. Of course, they possess a fine falsetto and do justice to the disco hits. But these guys even have the earlier Bee Gees songs down to a science, complete with intricate harmonies and quivering lead vocals. Have I mentioned these guys look a lot like the actual Bee Gees as well? And let’s get real…poor Maurice and Robin are dead and gone, and Barry hardly ever tours. The Australian Bee Gees are as close as you are going to get to a real, live Bee Gees show. The Australian Bee Gees are the hardest working men in show business- they play SIX nights a week at the Thunder Showroom at Excalibur at 7:00PM (dark Fridays). Why is it called the Thunder Showroom? Thunder From Down Under, of course! Those Australian hotties take over the theater at 9PM every night. (What is it with Excalibur and the Australian thing?! We have no idea.) With our deal, you have your choice of a special price on Australian Bee Gees Plus Buffet, or $14 off VIP seating with no buffet. But we think the Australian Bee Gees Plus Buffet option is really where it’s at. I mean, it’s free dinner! Even if buffets aren’t normally your thing, free Vegas dinner is hard to turn down, yes? Please note, with our ticket supplier Best Of Vegas, there are no hidden fees, unlike when you buy direct from MGM. Also note that you do have to pay for parking at Excalibur, as it is an MGM property. Lastly, no one under five years old is allowed at the show, so leave those disco-loving toddlers in the room. 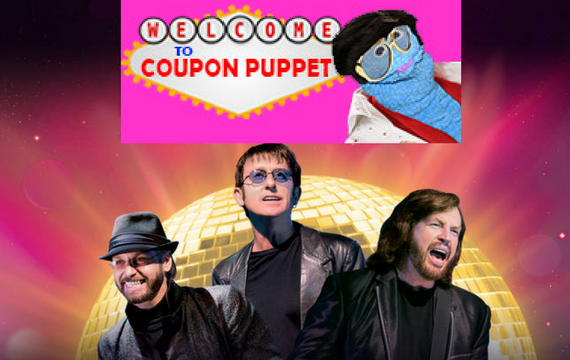 Coupon Puppet Loves Saving You Money On Australian Bee Gees Plus Buffet!